This wonderful hotel is located in the privileged zone in the South of Tenerife, Costa Adeje. Given its position, it offers priviledged views. It is of Colonial Canarian style, with tropical gardens and has an exquisite decoration full of harmony and elegance in each corner. Located only 500 metres from Bahia del Duque Beach, it is in the proximity of the best Golf course on the island and is only 20 minutes away from the Airport Reina Sofía. The hotel has 165 rooms all with sea views. There are 96 double rooms, 24 Junior Suites and 42 Deluxe Villas, as well as 2 Royal Suites and 1 Imperial Suite. All rooms are equipped with air conditioning, full bathroom with hydromassage shower and bath, bathrobes, hairdryer, magnifying mirror, complementary toiletries, bathroom scales, flat screen satellite television and piped music, telephone, Internet connection, minibar, safe deposit box and pillow menu. The Suites and Villas have four-poster double beds and dressing-room. The Villas also have a garden or solarium with private outdoor jacuzzi and essential oils bath menu. The 40m2 double rooms are exquisitely decorated and equipped with twin 1.05m beds, individually controlled air conditioning, full bathroom with hydromassage shower and large bath, hairdryer, bathrobes, slippers, magnifying mirror, a selection of high quality complimentary items and a pillow menu for personalised comfort. The Junior Suites comprise a 65m2 double room with lounge area (furnished with sofa and two armchairs) and terrace, separate dressing room, four-poster 2x2 double bed, full bathroom with hydromassage shower and large bath, hairdryer, bathrobes, slippers, magnifying mirror, a selection of high quality complimentary items, pillow menu for personalised comfort, individually controlled air conditioning, interactive satellite TV with music channels and flat screen, telephone, Internet connection, minibar and free safe deposit box. The villas are arranged around the garden and are designed to provide privacy and perfect relaxation. They comprise a 55m2 double room (not counting the terrace) with lounge area and terrace, separate dressing room, four-poster 2x2 double bed, full bathroom with hydromassage shower and large bath, hairdryer, bathrobes, slippers, magnifying mirror, a selection of high quality complimentary items, pillow menu for personalised comfort, individually controlled air conditioning, interactive satellite TV with music channels and flat screen, telephone, Internet connection, minibar and free safe deposit box. All villas have private garden or solarium and sea views; guests can also hire our exclusive butler service. new recipes and prepared using locally-sourced produce. The jewel of the hotel, is our "Nammu" Spa – a space of 2.500 m² to relax and unwind. 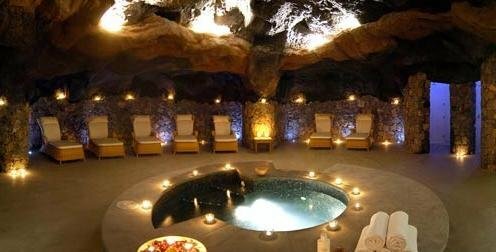 Enjoy our Thermal Circuits, like the "Canarian Circuit" in a volcanic cave set up or treatments with mineral properties followed by a banana facemask. "The Celta Circuit" and "The Thalassa Circuit" are other highly demanded circuits. Alternatively you will be able to choose from a wide range of health and beauty facial and body treatments.